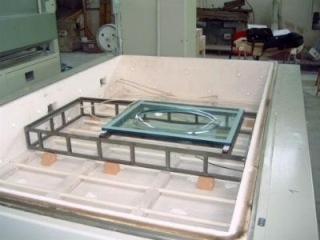 We produce electric furnaces designed for the production of washbasins by curving clear glass plate, or for the production of washbasins by casting, or to manufacture washbasins with laminated security glazing. These electric furnaces have fully automatic firing cycles both for curving and melting. • manual, semi-continuous or continuous management of the system's cycles. • automatic management of the curving and annealing cycle. • they are particularly suitable for intensive industrial production . 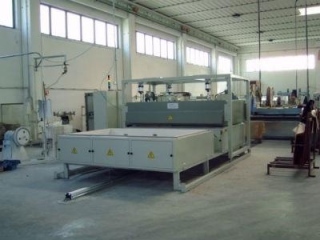 • automatic cooler for reducing the firing times. Clear washbasins, cast washbasins, glass for furnishing, glass for the automotive industry, glass for building, artistic glass for windows. The system is available in three sizes for the production of a single washbasin per module, or two or four washbasins per module.